Donkey Kong Country 2: Diddy's Kong Quest is an adventure platform video game developed by Rare and published by Nintendo for the Super Nintendo Entertainment System (SNES). It was released on 20 November 1995 in North America, on 21 November 1995 in Japan, and on 14 December 1995 in Europe. It is the second installment of the Donkey Kong Country series and serves as a direct sequel to Donkey Kong Country. It was re-released for the Game Boy Advance (GBA) in 2004. The game was made available for download on the Wii's Virtual Console in 2007, and for the Wii U's Virtual Console in 2015. It was followed by a sequel, Donkey Kong Country 3: Dixie Kong's Double Trouble!, in 1996. The story revolves around Diddy Kong and his girlfriend, Dixie Kong, who try to rescue Donkey Kong after he is abducted by King K. Rool. The game is set on Crocodile Isle, with eight worlds of varying environments, totaling 52 levels. The game utilises the same Silicon Graphics (SGI) technology from the original, which features the use of pre-rendered 3D imagery. Diddy's Kong Quest received critical acclaim, being widely regarded as one of the greatest 2D platformers ever made. Praise was directed at its graphics, gameplay, and soundtrack. It was the second best-selling game of 1995, the sixth best-selling game on the SNES, and the highest selling SNES title to not be packaged with the system. At the end of each level, the player must jump on a target pad for a chance to earn one of a series of quickly changing rewards, such as an extra life balloon. Donkey Kong Country: Diddy's Kong Quest is a 2D side-scrolling platformer in which the player controls either Diddy Kong or his girlfriend Dixie Kong through 52 varying levels over eight different worlds. The main objective of the game is to rescue Donkey Kong from King K. Rool. The game features a wide number of enemies, which include land-based reptilian Kremlings, rats, porcupines, bees and vultures. Enemies in underwater sections include pufferfish, stingrays and piranhas. Each world culminates with a boss fight, which is required to be defeated in order to progress to the next world. Similar to its predecessor, the player-characters may neutralise most hostiles by jumping on their heads, cartwheeling through them, or throwing a barrel at them. When hit by an enemy, the active character leaves the screen, thus control will switch to the other character. The player can reclaim their partner from marked DK barrels throughout the game. If both characters die, the player will lose a life and will restart from either the beginning of the level, or from the last checkpoint, which come in the form as a star-painted barrel. If the player loses all of their lives, the game will end. Diddy and Dixie have unique attributes; Diddy is more agile and will run faster, whereas Dixie has a higher jump and can spin her hair in order to float. The player can pick up the other character and throw them in any direction, similar to barrels. The game also features "Animal Friends", which returns from its predecessor. Playable animals include Squitter the spider, Rambi the rhino, Rattly the rattlesnake, Enguarde the swordfish and Squawks the parrot. These animals have unique abilities which the player can utilise, such as Rambi's ability to charge at enemies, Squawks' ability of flight, and Rattly's ability to jump extreme heights. The game features environmental effects throughout some levels, which includes fog, rain and thunder storms. Some levels feature different mechanics and settings, such as underwater sections, riding a mine cart, grappling onto vines, and "honey" levels which feature sticky surfaces. As with its predecessor, the game features barrels which will propel the player in any direction they are facing. Aside from checkpoint barrels, some give the player temporary invincibility or an "Animal Buddy". Bonus barrels hidden throughout the game transport the player to a bonus game, which features a challenge such as eliminating all enemies in order to earn a "Kremcoin". In addition, there are some barrels that can only be activated by a specific character. Players may earn extra lives by collecting balloons, earning 100 bananas or collecting four letters which spell "KONG". The game opens with Diddy standing on the deck of a pirate ship. In the ship's cabin, he finds a note stating that Donkey Kong has been kidnapped by Kaptain K. Rool, King K. Rool's moniker in this game, who had demanded the entire Banana Hoard that he stole in the previous game for a ransom from the Kongs. Diddy and Dixie subsequently attempt to rescue Donkey Kong from K. Rool. Together, they travel through Crocodile Isle and are helped on their way by an assortment of animals to defeat K. Rool and rescue Donkey Kong. Diddy and Dixie eventually battle and defeat K. Rool, though he escapes after releasing Donkey Kong. Shortly after, Diddy and Dixie discover a secret area known as the "Lost World". After going through the Lost World, they once again defeat K. Rool in "Krocodile Kore", in a hidden geyser at the heart of Crocodile Island. Upon being defeated, K. Rool is hurled into the geyser, causing it to clog up and explode. The explosion causes all of Crocodile Island to sink, as the Kongs watch K. Rool escape on a small sailboat. The player can achieve a 102% completion score for their save file by completing all levels and bosses, completing all bonus challenges, collecting all DK coins within the Lost World and visiting the four Kong family members at least once. The game is Dixie Kong's first appearance in the Donkey Kong franchise. Other characters include Cranky Kong, situated in "Monkey Museum", who is back due to "popular demand" to divulge secrets of the game world, provide comic relief, as well as offering advice. Wrinkly Kong, the wife of Cranky Kong and grandmother of Donkey Kong, makes her first appearance in this game. She runs an educational facility called "Kong Kollege", where she gives guidance to the player. Swanky Kong runs a gameshow quiz where the player may complete quizzes and earn extra lives. Funky Kong offers an aeroplane that allows the players to switch between already completed worlds. Additionally, the player can meet a large Kremling called "Klubba", at "Klubba's Kiosk", who demands a number of Kremkoins from the characters if they want to pass onto the "Lost World" and complete a secret level. Development of Diddy's Kong Quest began shortly after the release of Donkey Kong Country and utilises the same Silicon Graphics (SGI) and Advanced Computer Modelling (ACM) rendering technology, in which pre-rendered images are modelled as 3D objects and then transformed into 2D sprites and background layers. Rare founder Tim Stamper served as director of the game, whereas his colleague Brendan Gunn, who had worked on the original, returned to design the game. In response to complaints from veteran gamers, the game was designed to be more challenging than its predecessor. Diddy's Kong Quest's soundtrack was composed entirely by David Wise. In addition, the game's soundtrack was the focus of an OverClocked ReMix collaboration titled Serious Monkey Business. The final track, "Donkey Kong Rescued", was remixed by David Wise himself, featuring Grant Kirkhope on electric guitar and Robin Beanland on trumpet. Wise cited Koji Kondo's music for the Mario and Zelda games, Geoff and Tim Follin's music for Plok, and synthesizer-based film soundtracks released in the 1980s as influences in creating the music for the Donkey Kong Country series. As with its predecessor, the music was produced for the SNES's SPC700 chip for the game to sound similar to the Korg Wavestation synthesizer. The game received critical acclaim. The SNES version holds an aggregate score of 92% at GameRankings, whereas the Virtual Console re-release and the Game Boy Advance version both hold a score of 80% at GameRankings and Metacritic, respectively. 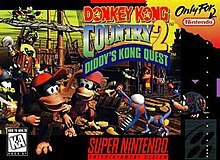 Diddy's Kong Quest sold a combined 4.37 million copies in the United States and Japan on the SNES; the total number of copies sold in Japan at 2.21 million, and 2.16 million in the United States. It was also the second best-selling game of 1995, after Yoshi's Island, and the sixth best-selling game on the SNES. Retailers struggled to meet the demand for the game. The graphics and gameplay were the most praised aspects of the game. Scary Larry of GamePro hailed the game as being longer, more graphically impressive, and more fun than the original Donkey Kong Country, and having "some of the most cleverly illustrated levels ever seen on a home system." He gave it a perfect 5/5 in all four categories (graphics, sound, control, and FunFactor), and said his one reservation is that some levels are too difficult for younger players. Aaron Kosydar of AllGame thought that Diddy's Kong Quest's graphics were superior to that of its predecessor, stating that the game "looks as cool as it plays." Dan Whitehead of Eurogamer stated that the graphics of the game were similar to the first Donkey Kong Country installment, although he praised them both as "impressive." However, Whitehead expressed concern over the lack of ambition from the sequel, stating that the gameplay uses the defense of "if it ain't broke, don't fix it." Reviewing the SNES version, Frank Provo of GameSpot heralded the graphics as "more detailed" although admitting that it appeared stylistically similar to the first game. In a separate review regarding the Game Boy Advance version, Provo praised the graphics as richer and "livelier" than those of the original. In a retrospective review, Mark Birnbuam of IGN stated that whilst the original "boasted some of the most beautiful graphics" on the SNES at the time, Diddy's Kong Quest offered a superior experience due to its detail, smooth animation and varying colour palette. Jeff Pearson of Nintendojo stated that Rare improved the graphics for Diddy's Kong Quest, and that the character animations appeared "much smoother and more cartoon like" in contrast to the computer generated feel in of the original. Pearson also heralded the background designs as reaching "newer heights" of quality. A reviewer of Cubed3 heralded the visuals as "unbelievable" for a 16-bit game. A reviewer of Jeux Video stated that the game "pushed the boundaries" of the console and that every detail was "devilishly handsome," and also praised the handling of the gameplay as being "pushed to a climax." A direct sequel, Donkey Kong Country 3: Dixie Kong's Double Trouble!, was released for the SNES in 1996 to positive reviews. In the game, Dixie Kong and Kiddy Kong must find both Donkey and Diddy Kong, who have been once again abducted by K. Rool. It was further followed by a succession of more related Donkey Kong video games, such as Donkey Kong 64 in 1999 and Donkey Kong Country Returns in 2010. Diddy's Kong Quest was later released for the Game Boy Advance on 15 November 2004 and on the Wii's Virtual Console on 21 May 2007. It was made available for the Wii U and New Nintendo 3DS Virtual Console in 2015 and 2016, respectively. In the United States, the game's Game Boy Advance version sold 630,000 copies and earned $19 million by August 2006. During the period between January 2000 and August 2006, it was the 41st highest-selling game launched for the Game Boy Advance, Nintendo DS or PlayStation Portable in that country. ^ "Chris Sutherland on MobyGames". MobyGames. Retrieved 15 March 2017. ^ a b "Diddy's Kong Quest release dates". Gamesradar. Retrieved 8 February 2016. ^ "Diddy's Kong Quest overview (Polygon)". Polygon. Retrieved 6 February 2016. ^ "Donkey Kong Country 2 GBA overview". Polygon. Retrieved 7 February 2016. ^ a b c d e f Provo, Frank (27 May 2007). "Donkey Kong Country 2: Diddy's Kong Quest review". GameSpot. CBS Interactive. Retrieved 1 January 2015. ^ a b c d e f g Provo, Frank (7 December 2004). "Donkey Kong Country 2 review (GBA)". GameSpot. CBS Interactive. Retrieved 1 January 2016. ^ "Diddy's Kong Quest overview". IGN. Retrieved 6 February 2016. ^ a b c d e f Donkey Kong Country 2: Diddy's Kong Quest manual (PDF). Nintendo. 1995. ^ a b c d Pearson, Jeff (19 June 2003). "Donkey Kong Country 2 (Review by Nintendojo)". Nintedojo. Retrieved 22 September 2009. ^ Rareware (20 November 1995). Donkey Kong Country 2: Diddy's Kong Quest. Super Nintendo Entertainment System. Nintendo. Level/area: Krokodile Kore. Cranky Kong: I knew you'd do it, Diddy m'boy, but how could you fail having learned all you knew from old Cranky here? ^ Curtiss, Aaron (18 January 1996). "Donkey Sequel Not the King, but a Good Kong". Los Angeles Times. Retrieved 17 January 2016. ^ Rareware (20 November 1995). Donkey Kong Country 2: Diddy's Kong Quest. Super Nintendo Entertainment System. Nintendo. Level/area: Monkey Museum. Cranky Kong: Come in and say hello to your old grandpappy Cranky. I'm back by popular demand to offer you my wealth of gameplaying wisdom for this unnecessary sequel. O.K, which of these would you like? ^ Rareware (20 November 1995). Donkey Kong Country 2: Diddy's Kong Quest. Super Nintendo Entertainment System. Nintendo. Level/area: Kong Kollege. Wrinkly Kong: Hello dearies, I'm Mrs Wrinly Kong, Headmistress at Kong Kollege. I'm available to teach courses in how to play this game, or you can just pop in when you want and save your little old game. ^ Rareware (20 November 1995). Donkey Kong Country 2: Diddy's Kong Quest. Super Nintendo Entertainment System. Nintendo. Level/area: Swanky's Prizes. Swanky Kong: Give them a big hand folks! Good evening, I'm Swanky Kong and you're tonight's contestants on my Bonanza! It's easy to play! Just pick a game and you're away! ^ "Donkey Kong Country 2 preview". Nintendo World Report. 21 April 2004. Retrieved 6 February 2016. ^ a b Goergan, Andy (14 February 2014). "Donkey Kong Country, Through the Years". Nintendo World Report. Retrieved 6 February 2016. ^ Kosydar, Aaron (14 November 2014). "Donkey Kong Country 2 overview". Eurogamer. Archived from the original on 14 November 2014. Retrieved 2 January 2016. ^ McFarren, Damien. "Month Of Kong: The Making Of Donkey Kong Country". Nintendo Life. Retrieved 12 April 2015. ^ The Feature Creature (January 1996). "Up in the Treehouse". GamePro. No. 88. IDG. pp. 40–42. ^ "OverClocked ReMix Presents 'Serious Monkey Business'". OverClocked Ltd. Retrieved 2 January 2016. ^ "ReMix: Donkey Kong Country 2: Diddy's Kong Quest 'Re-Skewed'". OverClocked Ltd. 28 October 2010. Retrieved 3 January 2016. ^ Greening, Chris (December 2010). "Interview with David Wise". Square Enix Music Online. Retrieved 27 August 2015. ^ Gera, Emily (6 March 2014). "Synth, big band jazz and the remaking of Donkey Kong Country's amazing sound". Polygon. Retrieved 6 February 2016. ^ a b "Donkey Kong Country 2: Diddy's Kong Quest". GameRankings. Retrieved 22 September 2009. ^ a b "Donkey Kong Country 2: Diddy's Kong Quest (Wii Rating)". GameRankings. Retrieved 5 February 2016. ^ a b "Donkey Kong Country 2: Diddy Kong's Quest". Metacritic. Retrieved 23 September 2009. ^ a b Kosydar, Aaron (18 July 2008). "Diddy's Kong Quest review". AllGame. Archived from the original on 14 November 2014. Retrieved 5 January 2016. ^ a b Whitehead, Dan (18 May 2007). "Virtual Console Roundup". Eurogamer. Retrieved 2 January 2016. ^ a b c Birnbaum, Mark (29 May 2007). "Donkey Kong Country 2: Diddy's Kong Quest Review". IGN. Retrieved 22 September 2009. ^ a b "Donkey Kong Country 2 Reviews". Cubed3. 8 November 2006. Retrieved 22 September 2009. ^ "Japan Platinum Game Chart". The Magic Box. Retrieved 22 May 2008. ^ "US Platinum Videogame Chart". The Magic Box. 27 December 2007. Archived from the original on 21 April 2007. Retrieved 3 August 2008. ^ a b Antista, Chris (14 October 2010). "New screens honor the legacy of Donkey Kong Country - but WHY?". GamesRadar. Retrieved 7 February 2016. ^ Welch, Hanuman (23 April 2013). "The Best Selling Video Game Of Every Year Since 1977". Complex. Retrieved 7 February 2016. ^ "Chart-Topping Sales and New Ultra 64 Titles for Nintendo". GamePro. No. 90. IDG. March 1996. p. 16. ^ "ProReview: Donkey Kong Country 2: Diddy's Kong-Quest". GamePro. No. 87. IDG. December 1995. p. 94. ^ "Test de deu Diddy's Kong Quest". Jeux Video (in French). Webedia. 22 August 2008. Retrieved 4 January 2016. ^ "Donkey Kong Country 3: Dixie Kong's Double Trouble! aggregate score". Gamerankings. Retrieved 6 February 2016. ^ Lucas, Thomas (4 January 2008). "Donkey Kong Country 3: Dixie Kong's Double Trouble! review". IGN. Retrieved 5 January 2016. ^ Casamassina, Matt (24 November 1999). "Donkey Kong 64 review". IGN. Retrieved 6 February 2016. ^ Harris, Craig (19 November 2010). "Donkey Kong Country Returns review". IGN. Retrieved 6 February 2016. ^ "Donkey Kong Country 2: Diddy's Kong Quest (VC)". IGN. Retrieved 6 February 2016. ^ "Donkey Kong Country 2: Diddy's Kong Quest (Wii U)". Nintendo US. Retrieved 5 January 2016. ^ Goldfarb, Andrew (3 March 2016). "Zelda, Metroid, EarthBound, More SNES Games Headed To New 3DS Virtual Console". IGN. Retrieved 8 September 2016. This page was last edited on 22 March 2019, at 09:31 (UTC).